Wonder Woman takes a whack at the interior hull of the giant mechanical Starro that is enclosing the City of the Future. She manages to dent it, but is unable to break through. Lucius Fox of Wayne Enterprises points out that self-repair systems are part of the technology inside the mechanical Starro, and are already working to repair the damage caused by Wonder Woman's punch. Fox warns that some other strategy will have to be tried rather than brute force. We are told that the city, inside the Starro enclosure, is moving towards a population center in Dubai. Dr. Ramzi urges members of The 99 to form a triad and halt the moving city. Suddenly, the mechanical Starro with the city inside is attacked by fighter planes. The giant Starro prepares to retaliate, and shoots down the planes before the pilots can be warned. Helicopters arrive at the flying city, which sends out a signal that translates as "Hail to the King". Rughal of Mamluk International emerges from one of the helicopters, causing others to declare that he has corrupted everything the City of the Future is supposed to stand for. At The 99 Steps Foundation in Spain, Flash indicates that their surveillance technology has confirmed that Rughal is under the influence of Starro. There is some discussion and conjecture about the true purpose of the mobile city, as it heads towards Dubai. Batman insists that the city is not designed as a weapon. Batman asserts that the purpose of the moving city inside the Starro mechanism is to spread the Starro infection to unaffected citizens in population centers. Batman says that they need to stop the city before it reaches Dubai; and use it for its original purpose, to save the planet. He indicates that they will need more power to accomplish this. In Brazil, Hawkman uses his communicator to talk to Batman. They agree that Superman is needed; but suspect that he has fled the planet. Hawkman indicates he is not equipped for outer space travel; but Firestorm arrives and says that he can do it. Just like last issue, the Firestorm matrix again includes Jason plus a triad from The 99; although this time they are doing it on purpose. The triad within Firestorm consists of Hadya the Guide, Bari the Healer, and Fattah the Opener. Since Fattah's power is teleportation, that will help Firestorm get where they need to be very fast! The miniature Starro that was removed from the boy who was causing the earthquakes reattaches itself at the base of his neck, and the boy (Hafiz) loses control again, causing another earthquake. The triad of Darr the Afflicter, Rafie the Lifter, and Hafiz go into action. They use their combined powers to attempt to heal the earth itself, and undo the earthquake damage. At the City of the Future, the mobile city stops in front of Dubai. Rughal, who is now aboard the mechanical Starro that encloses the city, tells Dr. Chou to activate phase three of their plan. Dr. Ramzi contacts Rughal, but is unsuccessful in reasoning with him, as Rughal gloats and rants. As they banter, Rughal claims that he is in partnership with Starro to rule the world; but Dr. Ramzi tells Rughal that he is really being controlled by Starro, and is just a pawn. Rughal arms torpedo tubes coming out of the base of the city. They are full of Starros; and will be used to infect the citizenry. Just then, members of the JLA (Flash, Batman, and Atom) and The 99 (Jabbar the Powerful, Noora the Light, and Jami the Assembler) are flying towards the City of the Future to assist. They quickly go to work disarming the torpedoes. In outer space, Firestorm (with the triad still inside) is approaching Superman, who appears to be attempting to fight off the Starro infection. Superman, still under Starro's control, sends a blast of heat vision in the direction of Firestorm, who turns intangible just in time to avoid getting fried. Bari attempts to cure Superman, but Superman lashes out at Firestorm, making things very complicated. Bari needs to hurry if he can accomplish his task before Superman takes Firestorm down. Dr. Ramzi tells Rughal that the heroes are fighting back, and have grounded the mobile city. We see some good teamwork, as Jabbar the Powerful punches through the hull so Flash can use his speed to disable the infected civilians and Atom can head to the communications center where his scientific expertise may be useful. Batina the Hidden has three minutes to reach the command center to disarm the fail-safe system, which is about to blow with the destructive force of several nuclear bombs. Batman summarizes the current plight, saying the heroes are being attacked on many fronts and must use reason to prevail. Dr. Ramzi explains to Rughal that the current crisis is a result of fear and mistrust; and that Rughal should come to his senses and fight back against the forces of evil. Dr. Ramzi reminds Rughal that the people of the world must join together and fight for what is right, just as the heroes are doing now. Firestorm appears to be successful in removing the miniature Starro from Superman's neck, freeing Superman from the mind control attack. In response, Superman gets that red-eyed look, shouts "Starro" really loud, and heads back towards Earth. Story - 4: I continue to enjoy this historic series. The Justice League and The 99 work well together. Now that I am familiar with many of the members of The 99, the stories are a bit more fun. It took a couple of issues to get into the swing of things. I like the idea that each member of The 99 has a single superpower; but that in every case, a triad of three or more members must combine their powers to be effective. That is an interesting concept, and adds an element of fun to each story. There are tens of thousands of permutations featuring three members chosen from 99; so variety will never be a problem. I can see why The 99 has grown in popularity so quickly in the Arab world. And The 99 is indeed quite popular. The series was first introduced in 2006 in the Middle East. Already, according to Wikipedia, the first of five planned 99-based theme parks opened in Kuwait in March 2009. Also, an animated series is in production. In such a short time, that is a meteoric rise in popularity! The story was fast-paced in this issue. There were threats on multiple levels for the combined team to tackle. We saw attempts to breach the enclosure containing the City of the Future, attempts to stop the mobile city from reaching Dubai and spreading Starro's influence, attempts to heal the earth from the effects of the recent earthquakes, and attempts to reach Superman and free him from Starro's mind control. We have quite a cliffhanger ending, with the City of the Future about to be annihilated in a horrific explosion unless Batina the Hidden reaches the command center in time to stop it. And, as if in response to Batman's claim that they will need more power in order to save the planet, we have Superman, just freed from Starro's mind control, speeding back to Earth to confront the Starro menace. It looks like it will be "Superman to the rescue" as the story winds to a conclusion next issue. Art - 3: The artwork was solid if unspectacular this issue. I really liked the opening splash page featuring Wonder Woman as she pounded on the hull of the enclosure surrounding the city. Cover Art - 4: Felipe Massafera does a fine job with this cover. I continue to be a fan of the realistic way he draws the heroes. 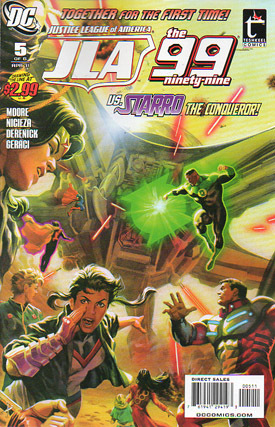 This image has depth and energy; as we see Green Lantern (John Stewart) attack the mechanical Starro while several heroes from the two teams prepare to enter the fray.